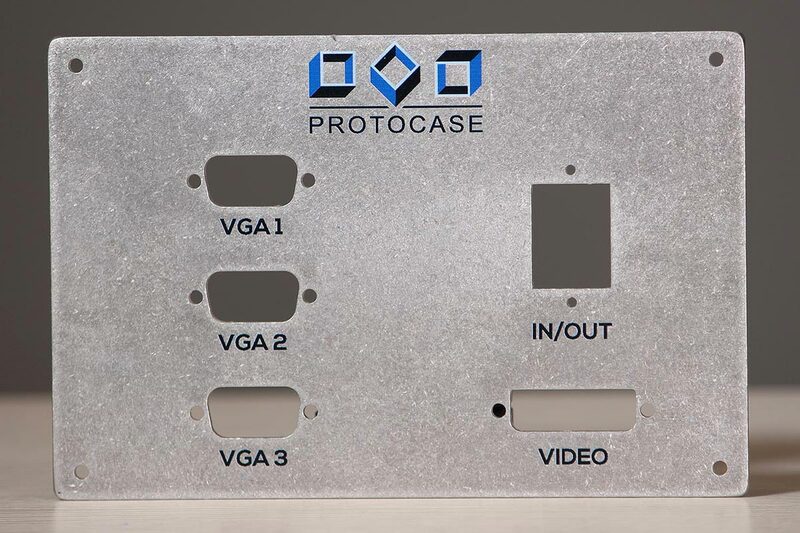 Protocase offers the latest in digital print technology to customize sheet metal enclosures and parts by using our cutting-edge flatbed direct digital printing with laser alignment technology for accurate and crisp printing of complex visuals with eye-catching results. 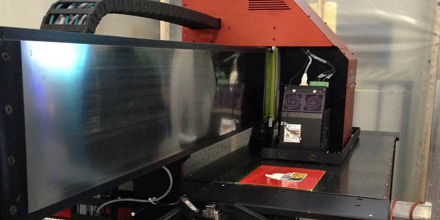 Common applications for direct digital printing include labeling connectors, switches and ports, adding special graphics such as a company logo and printing product identifier graphics. Our digital printing uses the halftone technique to create color prints. Halftone creates color prints by blending various densities of small droplets of Cyan, Magenta, Yellow and Black. The effects created are brilliant colors and gradients our eyes perceive as solid from a distance. However, at close range, the eye can see this half-toning effect because some of the larger droplet sizes are detectable by the naked eye. Our Digital printing is ideal for graphics with high amounts of detail, such as a gradient finish, CGI effects or overlapping colors. 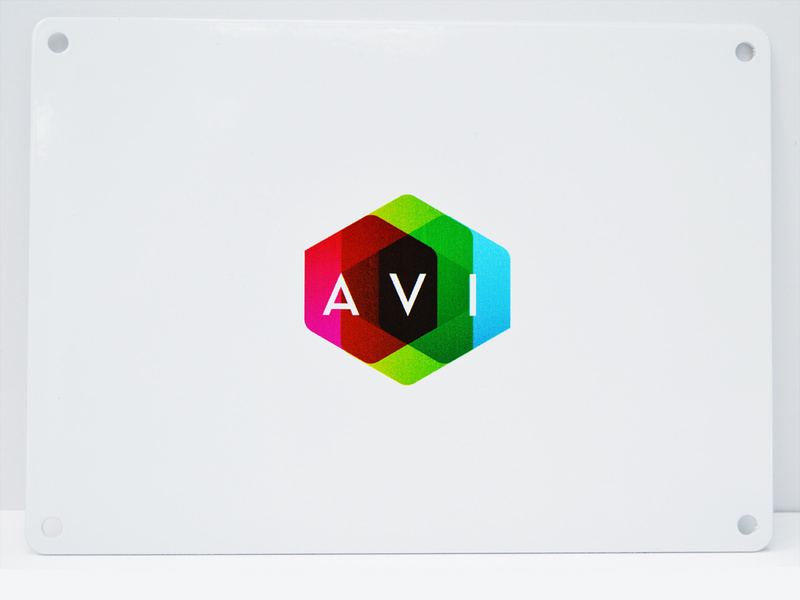 Digital printing is also best when there are multiple colors used in one single graphic. 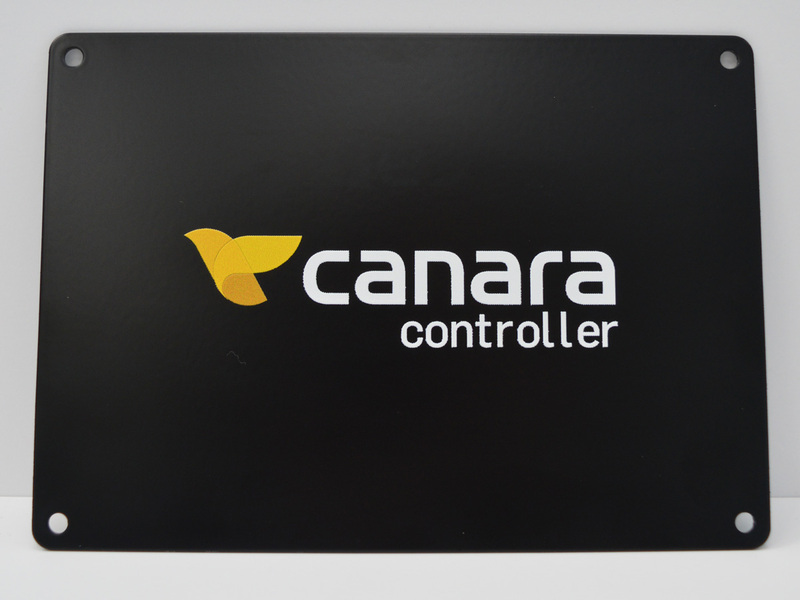 Digital print technology produces a slightly raised and textured surface, especially when compared to silkscreening, as the self-levelling silkscreening ink used produces a smooth finish that's virtually indistinguishable by touch. 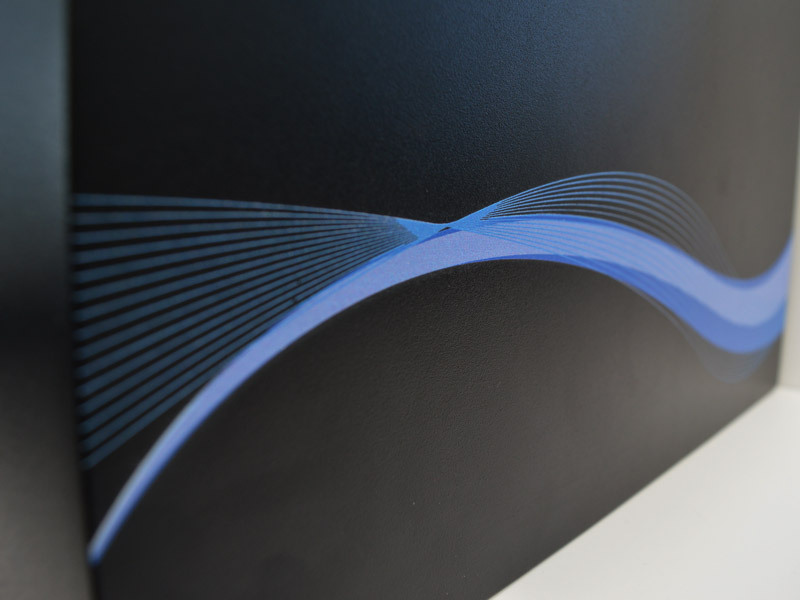 Digital print is laid down linearly by scanning UV ink jet heads, and cured immediately after. This means the ink can self-level (flow), so there is a slight linear texture that becomes visible in large areas of single color. Those used to silkscreening should be aware they may perceive a difference if they closely examine the surfaces. 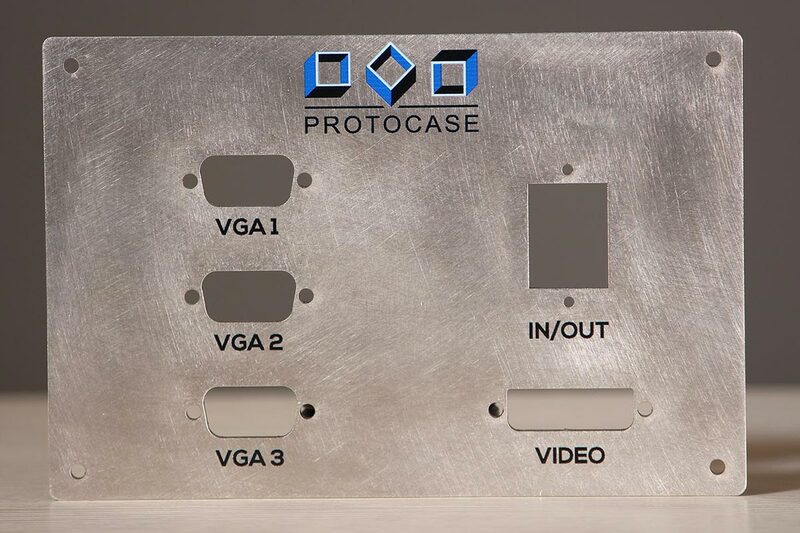 Digital print is available on all enclosures, parts and panels with powdercoat finishes, as well as on bare-metal finishes for flat parts and panels. Digital printing is superior in producing images on textured surfaces such as sandtex powdercoat. This is because the ink jets downwards, effectively filling the low spots (in contrast, silkscreen is a planar process that can leave voids). Please note: The clarity of the digital print can be greatly affected by the texture of powdercoat used. For best results, we recommend choosing a powdercoat with a textured finish. Digital printing will look sharp on various textures and colors, but each situation is unique. 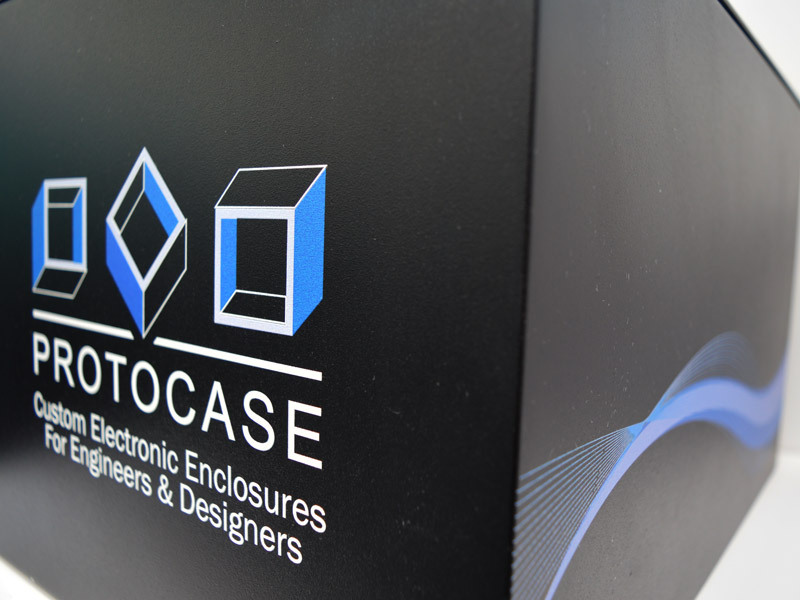 For more information, please contact us at info@protocase.com. As with everything in the manufacturing process, there are always some variance between parts and images (spatial registration). We use laser alignment which allows for a tight tolerance (0.020" | 0.51mm) which is more than adequate for most applications. However, there are special circumstances where these standard tolerances are not adequate. In these situations, our eye is highly sensitive to the geometrical relationship between physical features and print pattern. The most common situation is concentricity. See notes below. We have solutions, but extra set up charges may apply where tighter tolerance is needed. We will be pleased to help you determine if your project is suited for digital printing. Please email info@protocase.com if you have any additional questions. Flat parts with bare-metal finish can have self-clinching fasteners installed, as long as the fasteners are not protruding from the printable face. The maximum height for parts and panels with fasteners protruding from the opposite side of the printable face is 6" (152.4mm). You can also include Graphics on your Solid works Models. Please note: Saving a Raster image as any of the vector file formats will not create a vector graphic. You may need to contact the individual who created the graphic, in order to access the necessary files. To ensure highest print quality, vector graphics files (particularly Adobe Illustrator Files - .ai) are recommended. Vector PDFs are accepted as well. We do not recommend printing bitmap formats directly (.png, .jpeg, .pdf, etc.) as the inherent pixilation does not produce good results. We recommend that you convert such bitmap files. If you can't, we would be happy to do so for a reasonable fee. We also offer design service to create images from hand sketches or photographs. All of our stock powdercoats have been tested and digital ink offers excellent adhesion and durability. We recommend assessment of ink adhesion to custom powdercoat colors. Digital print is superior in producing images on textured powdercoats such as sandtex powdercoat. 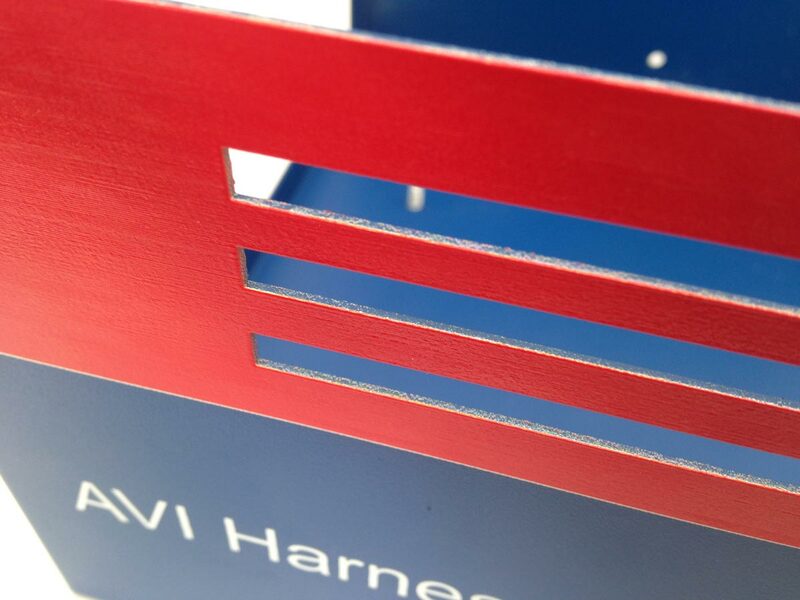 Digital printing will look sharp on various textures and colors, but each situation is unique. 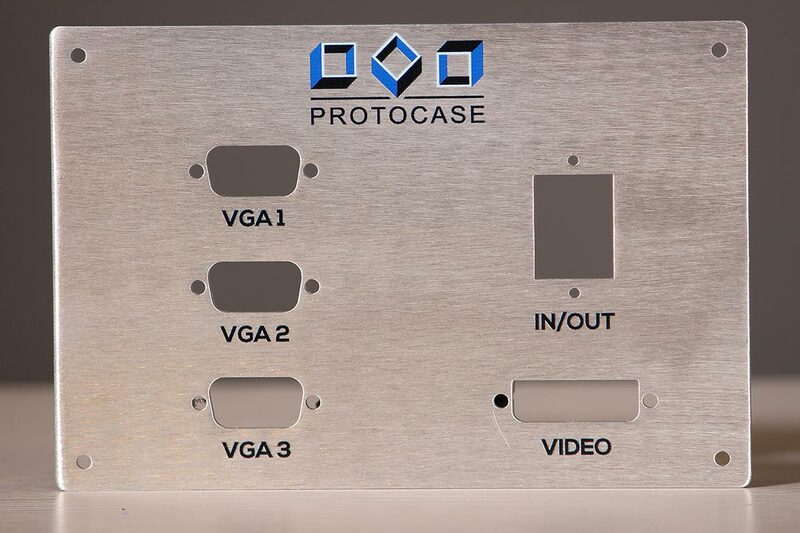 For more information, please contact us at info@protocase.com. The full spectrum of CMYK colors are offered in our digital printing services. Color letters on signal white powdercoat base are legible to 6 pt font for both sans and serif fonts. For colored letters on non-white powdercoat, minimum font size is 10 pt for Serif fonts and 8 pt for Sans Serif fonts. Please note: Fonts that appear smaller than Times New Roman and Myriad Pro may have to be enlarged to ensure proper white underbase. Please email info@protocase.com for more information. The clarity of digital print on bare-metal finish can be greatly affected by the bare-metal finish used. For best results, we recommend 10pt minimum font size for Serif fonts, and 7pt for Sans Serif fonts. When using digital print on bare-metal finish, particularly Grained Finish, there will be a small amount of ink bleeding. 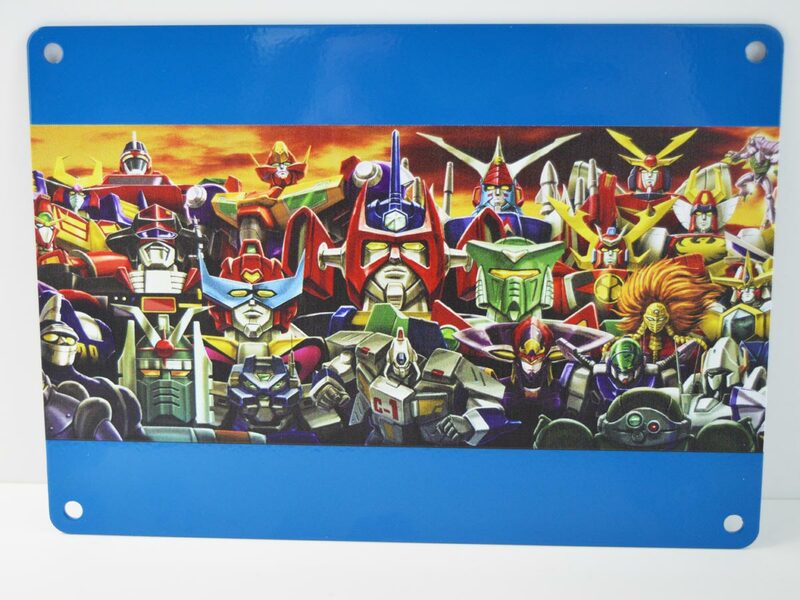 This isn't very detectable to the human eye unless one looks very closely, however, it is something you should be aware of when choosing digital print on bare-metal finish. We can print over cutouts on panels and enclosures by masking the opposite side in order to catch ink that would otherwise spray the other side. However, please note: a miniscule amount of overspray ink may stick to the inside wall of the cut-out. 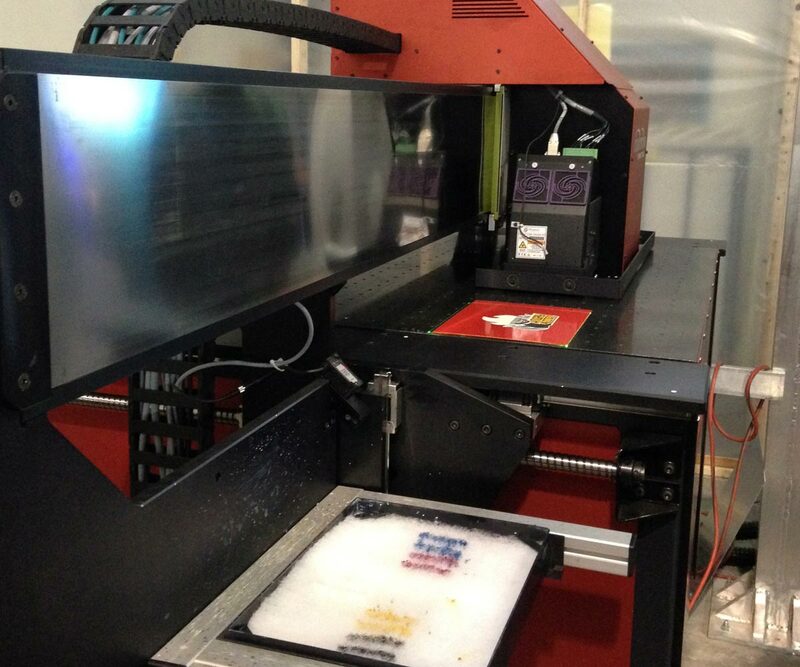 Using aerospace laser alignment technology, we are able to manually position and optically align parts and enclosures on our flatbed to print with registration of ± 0.020" (0.51mm) between part cutouts and print pattern.